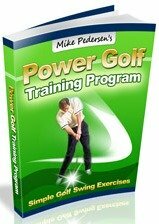 Here are some relatively easy ankle exercises and lower leg strengthening tips to add to your golf strength training routine. Your ankle and foot are the only parts in contact with the ground during the golf swing, which makes them an extremely important area to focus on with your golf strength training program. The main areas that need to be strengthened are the calf muscles, ankle inverters and everters. To calf complex is the strongest group in the area, and is relatively easy to strengthen. The ankle inverters and everters are responsible for side to side movements of your foot. Strengthening these are extremely important for stability throughout the golf swing, and even more so when on uneven surfaces. An absolute must for any golfer is the ability to maintain your balance throughout the entire golf swing. 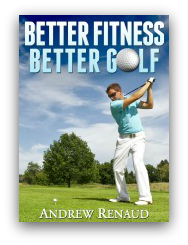 Many golfers with either altered mechanics or a poor weight shift will find balancing difficult. You will see them struggle to maintain form, particularly at the end of their follow through. While fixing the mechanical issues is one main component to help solve that issue, strengthening the entire lower leg, especially the ankles, is also crucial. 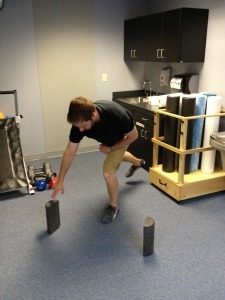 In addition to these ankle exercises, Balance Exercises are a great way to improve ankle strength. Follow the link for more information. While you can perform many ankle strengthening exercises without equipment, a few relatively cheap additions will help tremendously. These would include resistance bands, weights, and/or 1/2 foam rolls. 1. Calf Raises - A very simple exercise to increase calf strength. To perform the exercise, simply stand on your toes and repeat! Too easy? Grab some free weights! Variations: Eyes closed, toes pointed in/out, or tandem stance (one foot directly in front of the other) for balance. 2. Single leg balance - Very basic ankle strengthening, pretty self explanatory! Try to hold for 15-20 seconds. This can be made more difficult with a few variations such as closing your eyes, or standing on a soft/uneven surface (foam, pillow, couch cushion etc.). 3. Single leg balance with reach - Takes it up a notch! This can be made harder by adjusting the height that you reach to (the floor will be harder to reach to than a bed for example). 1. Stand and balance on the right leg and then with your right arm reach laterally to the right and tap with your hand (tap the floor, a cone, bench etc.). 2. Then return to upright position and reach with the right hand again, but to the left and tap. Repeat for 10 or more reps with the right hand, alternating taps to either side. 3. While still on the right leg, perform some reps with your left hand. 4. Repeat the entire process on your left leg. Also, make sure to bend the knee on your stance leg while reaching to get a extra quad workout! Variations: Alter the height as mentioned above, hold a weight in the reach hand, stand on an uneven surface. 4. 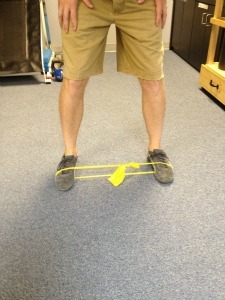 Lateral band walks - This is one of my favorite all time leg and ankle exercises! It is a great exercise not only for your glutes, but with the version described here, for the quadriceps and ankles as well. You should feel the burn in the outside aspect of your lower legs, the front of your thighs, and in your rear end. Equipment requirement: Resistance band. I usually use shorter bands that are tied into a loop, simply because they are more readily available to me. However, If you have long, straight bands (say, purchased from a sporting goods store), a slight modification will need to be made, but the results will be the same. 1. Begin standing, toes forward, with the band wrapped around the balls of your feet. 2. Perform a small squat (knees at 45-60 degree angles), but emphasize the glutes by sticking your rear end back and bending forward at your hips. 3. Now sidestep to the left, remaining in the squatted position, keeping constant tension on the band. 4. 10-20 feet in one direction is great, and then stop and go to the other direction. 1. With a long resistance band lying on the ground (perpendicular to the front of your body), stand on the band with both feet shoulder width apart. 2. Bend down to grab both end on the band with your hands and hold. 3. Perform a small squat (knees at 45-60 degree angles), but emphasize the glutes by sticking your rear end back and bending forward at your hips. 4. Now sidestep to the left, remaining in the squatted position, keeping constant tension on the band. 5. 10-20 feet in one direction is great, and then stop and go to the other direction. 5. Inversion/Eversion - Inversion is a term for turning your foot towards the opposite foot. Eversion is a term for turning your foot away from your other foot. For these ankle exercises, you will need a resistance band with either a handle or loop at one end. Put the loop/handle around the front of your right foot and hold the resistance to the right of your foot. Then turn your foot to the left for inversion. For eversion, hold the band to the left of your right foot and turn your ankle/foot to the right. Repeat on the left side. 15-20 repetitions.